This chapter examines the social media tool Facebook through the lens of teaching theory. We reflect in detail on the challenges such social media present to those working in Higher Education. 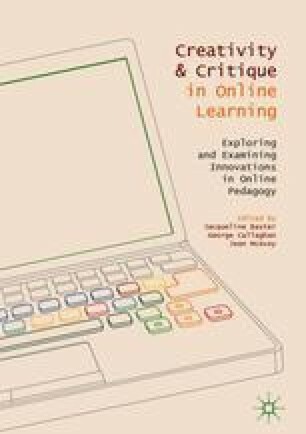 The chapter begins with a review of the literature surrounding social theory of learning, particularly on the debates around informal learning. This is followed by a discussion of social media in Higher Education. Data from the Faculty Facebook page is used to illustrate how this technology stimulates and encourages informal learning. We go on to take a critical perspective to explore the ethical and practical challenges of using commercially controlled software within an HE environment. The concluding section then presents a summary and points to useful areas of future research. Guardian. (2015). Social media overtakes entertainment as favorite online activity. https://www.theguardian.com/media/2015/sep/02/social-media-overtakes-entertainmemt-as-favourite-online-activity. Accessed 26 Aug 2016. Guy, R. (2012). The use of social media for academic practice: A review of literature. Kentucky Journal of Higher Education Policy and Practice, 1(2), 1–20. http://uknowledge.uky.edu/cgi/viewcontent.cgi?article=1015&context=kjhepp. Accessed 18Aug 2015. Jakovljevic, M., Buckley, S., & Bushney, M. (2013). Forming communities of practice in higher education: A theoretical perspective. In Management, Knowledge and Learning International Conference, Croatia. http://www.toknowpress.net/ISBN/978-961-6914-02-4/papers/ML13-368.pdf. Accessed 31Jan 2017. Lewis, H. (2016). Did fake news on Facebook swing the US election? New Statesman. http://www.newstatesman.com/world/2016/11/did-fake-news-facebook-swing-us-election. Accessed 24 Nov 2016. Marsick, V. J., Watkins, K. E., Callahan, M. W., & Volpe, M. (2006). Reviewing theory and research on informal and incidental learning, online submission. http://files.eric.ed.gov/fulltext/ED492754.pdf. Accessed 8 July 2016. Naughton, J. (2016, July 3). Few news providers with now by liking Facebook. Observer. https://www.theguardian.com/commentisfree/2016/jul/03/facebook-journalism-news-feeds-partisan-politics. Accessed 8 June 2016. Taylor, J. (2013). Learning journeys: The road from informal to formal learning – The UK Open University’s Approach. Journal of Interactive Media in Education, 2. http://jime.open.ac.uk/articles/10.5334/2013-08/. Accessed 23 June 2016. Viner, K. (2016, July 12). How technology disrupted the truth. Guardian. https://www.theguardian.com/media/2016/jul/12/how-technology-disrupted-the-truth. Accessed 13 July 2016. Weller, M. (2013). The battle for open – a perspective. Journal of Interactive Media in Education, (3). http://jime.open.ac.uk/articles/10.5334/2013-15/. Accessed 24 June 2016. Wenger, E. (2010). Communities of practice and social learning systems: The career of a concept. http://wenger-trayner.com/wp-content/uploads/2012/01/09-10-27-CoPs-and-systems-v2.01.pdf. Accessed 9 Sept 2016.